Learn how your business can leverage AI to deliver deep search and visibility across B2B transactions. See how BTI with Watson can help detect anomalies before they impact your business. Modernize B2B integration by enabling enterprise to achieve their goals of increasing revenue, up time, and efficiencies. In this era of digital transformation, learn how IDC defines the five “Cs” critical to building a smarter supply chain. By modernizing B2B integration – complementing EDI with blockchain, IoT and AI – you can achieve supply chain excellence. Use AI to gain end-to-end visibility into your supply chain to proactively predict, assess, and mitigate disruptions. The power of AI and Blockchain to drive greater supply chain visibility and mitigate disruptions. Mature supply chains are beginning to function within a network of networks. Supply Chain Visibility Made Easy! 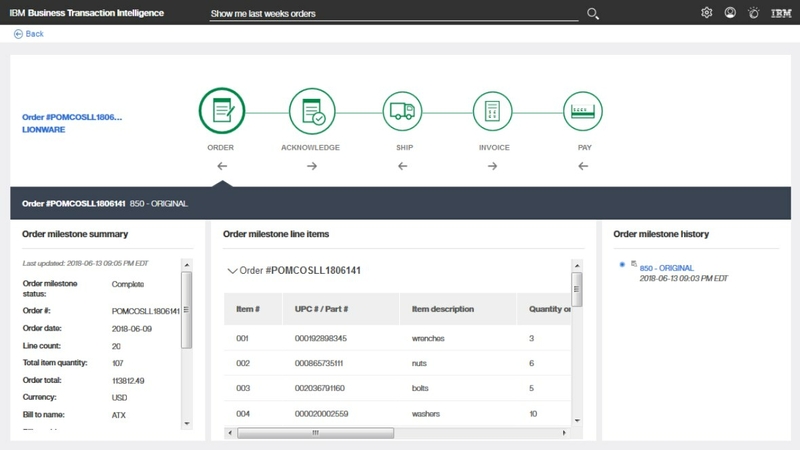 Learn how business users can easily find answers to supply chain questions. Electronic trade in business environments has historically been complex and full of high costs.